My former apartment in New Orleans was located at the corner of Royal and St. Ann. Yeah, another newbie moves to the city and sets up shop in the French Quarter, well, please don’t begrudge me my stereotype, I liked living in the Quarter and upon my return, it’s probably where I’ll choose to live again. Why not? I like a lot of noise, I keep odd hours and there’s a feeling there unlike any I’ve ever experienced, living in a museum so to speak…I should also note, I’m a white male, and being of such human classification in this part of New Orleans, who beyond certain political opinions and philosophies, has a clean record and doesn’t make a habit of breaking any serious laws, one might think that walking down Royal Street or up Decatur in the middle of the night, when a passing squad would hit the lights while it crept the streets, it would be of no concern. Wrong. I always, and still do feel that fast adrenaline jolt, and I also immediately look for the escape route. It might sound overly dramatic, but I can’t help it. So, if I feel this way about the NOPD, I can only imagine what it must be like for everybody else, the dismissing of complaints made by women, the unwarranted brutality, the racial profiling. The NOPD has a reputation that precedes them, and the many examples in the report show those reputations are hard-earned by years and years of their criminal behavior, leading to a public perception that the officers in New Orleans are best avoided by all. Such a question was always met with outright laughter. It was kind of an understanding we had that at best the NOPD wouldn’t catch anybody and at worst, whomever called would wind up in trouble when they ran his or her name for unpaid parking tickets or some other such minor offense that comes with the age and the time. I don’t mean to imply there aren’t decent cops on the NOPD. I’m sure there are good officers on the force who are deserving of respect, much like the police in other places I’ve lived, Chicago, Seattle and San Francisco, but the problem is I never really seem to run into those particular officers. In Chicago, it was because I was in the punk rock and anarchist scene and we were targeted. In Seattle, I was part of the Battle in Seattle down with the “just say no to the WTO” crowd, so we were targeted. In San Francisco, I lived in a neighborhood that was all homelessness, drugs and prostitution 24/7, and with my skin color in the middle of the night, I’d get targeted. A friend of mine in the social work world who also lived in the Tenderloin would commonly refer to it as being stopped for “walking while white.” The SFPD would seem almost disappointed I wasn’t on the street to buy crack or pick up a prostitute, that I actually lived there, by choice even. But nervous around the NOPD? A white guy? In the French Quarter? Simply put, the other understanding my friends and I shared was the NOPD could and would pretty much arrest anyone they felt like and once the NOPD arrests you, anything can happen. Law and due process are more of a pesky “guideline,” and one that can be ignored if you catch a cop in the wrong mood. The NOPD always had the reputation of being Wild West types who really played without any sort of rule book, and when they are the same ones to enforce any rules that do in fact exist, ultimately there are no rules beyond what they feel like at any given hour. Although the report identifies several instances of improper gun discharges by police — often in cases where officers shot at moving cars against NOPD policy — the department during the past six years has not found that any officer violated policy. Each of the homicide investigations into officer-involved shootings from January 2009 to April 2010 was “deeply flawed,” the report found. Investigations were too cursory to determine whether the shooting was justified under the law, which requires that an officer perceive he or somebody else is in imminent danger of death or bodily injury. Officers under investigation were temporarily assigned to the homicide division, a practice that seems to be a conflict on its face. Sometimes, homicide detectives would tell the officer under investigation that his statement was being “compelled,” meaning his statement could never be used against the officer in a criminal prosecution. “It is difficult to view this practice as anything other than a deliberate attempt to make it more difficult to criminally prosecute any officer in these cases, regardless of the circumstances,” the report contends. Nonetheless, I do remember much of what he said, and I hold out hope that he was sincere and will really try to fix things, not that it will be easy…far from it, especially in a city with the levels of poverty that are found in New Orleans. Poverty and crime are linked. Well, the middle class and poorer neighborhoods in New Orleans are getting hungrier by the year. Jindal’s new budget cuts back on health care for the poor. It cuts education programs for at-risk youth. It dramatically increases costs for higher education. When the city and state already had a dramatic need for social service programs and assistance for its residents, and the governor responds by cutting back, every year on what is already not enough, well, the end results ain’t gonna be good. Not to mention a Congress that would seem to like nothing more than steal the lunch money from a kid on his way to school so they could give it to their friends, and their K Street friends’ friends. The working middle class and the poor? And like any city across the country, as in New Orleans, what do you think some of the “what you can” will entail? So yes, the NOPD’s gonna have an even bigger job to do. Here’s hoping that Serpas can do what he said, change the police climate because the items in this report speak directly to a climate of in-house crime, especially when officers break the law by covering for other officers, or setting up the system of investigation to be a roadblock to the very same internal investigations meant to assess wrong-doing…Now, to be fair, the NOPD has made a start, essentially decriminalizing minor possession of marijuana to free up officers’ time to pursue more serious crime. 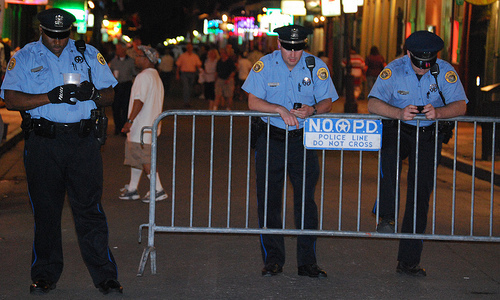 A college degree is now required to advance up the NOPD ladder. And along with accepting this investigation by the DOJ, a federal judge will be overseeing the actions of the NOPD. It’s a small start, but it must continue. Maybe, along with giving the keys back to the people at the ARK building in the Marigny, the NOPD could start to earn back the citizens’ trust by arresting every person in business or government whose decisions set the stage for more economic suffering in the poorer neighborhoods across the city? Changing the inner operations of the NOPD, all the way down to the cops walking the street would certainly be a positive and it is so very necessary for the safety of the city. It will take time, but imagine a day when the NOPD does the job the right way, and not just because a judge is watching. Imagine a time when the average citizen, no matter the skin color or gender has the honest expectation they will be respected by an officer in the NOPD, simply because that’s the norm. Personally, it’d be nice this time round to not have a flight instinct when I see police lights circling behind me on a dark French Quarter street, let alone anywhere else in the city of New Orleans. This place is just too amazing for that, it deserves much better than its gotten and it has deserved it for years. I don’t care what district you’re in, all people are deserving of protection and respect by the police. And nobody should need protection from the police, ever. So good luck Ronal…here’s hoping you mean what you said when you promised to take the DOJ report seriously. Maybe you can even be one of the first officials in the entire country to seriously try to do something about the problems of climate change, even if it’s only the climate inside your own department.